American Brewer is a quarterly magazine packed with engaging articles on topics that matter to decision makers in the brewing industry. Informative, comprehensive and sometimes controversial, American Brewer focuses on “The Business of Beer” in a variety of ways. From newly emerging trends to incisive analysis, American Brewer offers compelling content written and compiled by an award-winning staff comprised of experienced journalists. American Brewer print subsciptions are available through the Brewing News store here, four issues a year for $50 US. To contact American Brewer with any observations, comments or corrections, please click here. American Brewer is an effective way to reach brewers and business owners with your product or service information, via a display ad or in our Business of Beer directory. Click here to contact us for further information. 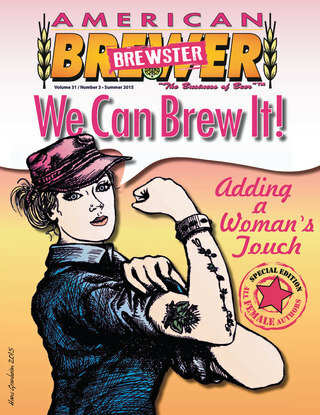 Click here to or on the cover below subscribe to American Brewer Magazine! Digital archives of American Brewer are available via the cover links below. Just click on the issue cover to preview the first 8 pages of any issue. A 'guilt-free" annual subscription (no print issue reduces the carbon footprint) includes each new issue for one year (along with the previous 3 issues). A complete archives annual subscription is also available. This issue, written and edited female writers, is now permanently available in its entirety. We support the Pink Boots Society!